The American Shetland Sheepdog is a small, pretty, intelligent, elegant companion and working dog. Without a doubt if you have a Sheltie you own one of the most beautiful breeds in the world. Known for their sturdiness and tremendous agility, these are the descendants of the tough, little working dogs from the Shetland Islands. 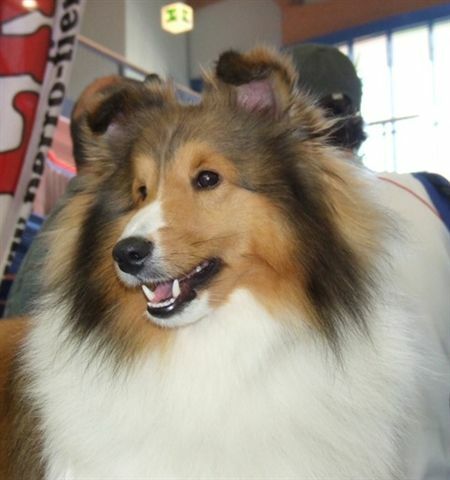 In America the first Shetland Sheepdog was registered as a breed in 1911 and the American Shetland Sheepdog Association (ASSA) held its first show in 1933. By the late 1940's the Shelties in America and Britain had diverged and today they are quiet different in character and appearance. In general the American Sheltie is slightly bigger, athletic, elegant and has a sweet, intelligent expression when he looks at you. I remember when I got TJ my thought was I could not imagine a more beautiful dog and I did not think that anyone can even paint such a beauty like him. Just amazing. And you can see the clever little fellow behind those cute eyes. Being his owner was one of the happiest time in my life. Regardless of the gender, American Shelties are gentle, alert, outgoing, solid structured, extremely intelligent and real working dogs and a lovely companion that is easy to live with. It's no wonder why they are so popular in America and why would everyone not want to own one. But there are some traits that might not fit into your life style: he is vocal. He talks a lot and you might love it and think he is just adorable and funny and expressing that he is the happiest dog on Earth, but your neighbour might have a slightly different opinion. So, please consider your circumstances before you choose your new life companion. Shelties are amazing, loyal, friendly and I feel privileged to have my own Sheltie family. Belmar That's A Nice Boy "TJ"